The National Caramel Custard Day is dedicated to a creamy dessert made with milk, sugar, and vanilla. This food-related holiday is celebrated on October 3. The word “custard” refers to a variety of desserts based on a mixture of egg yolk and milk or cream. Caramel custard is a custard dessert topped with a layer of soft caramel. It is popular throughout the world. While North Americans call it caramel custard, most Europeans know it better as crème caramel. 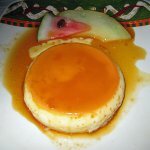 In Spanish-speaking countries it is usually called flan. Caramel custard is a popular dessert that can be found on the menu of many restaurants. But if you want to try your hand at cooking fancy desserts, you can make it yourself for the National Caramel Custard Day. In a heavy saucepan, cook 3/4 cup sugar over low hear until melted and golden, constantly stirring. Pour the caramelized sugar into eight 6-ounce custard cups so their bottoms are coated and set aside for 10 minutes. In a bowl, beat 6 eggs, 3 cups milk, 3/4 cup sugar, and 2 tsp vanilla extract until combined. The mix must not be foamy. Pour over caramel. Place the cups in two 8-inch baking pans. Pour boiling water in pans to a 1-inch depth. Bake for about 45 minutes at 350 °C. Unmold before serving.